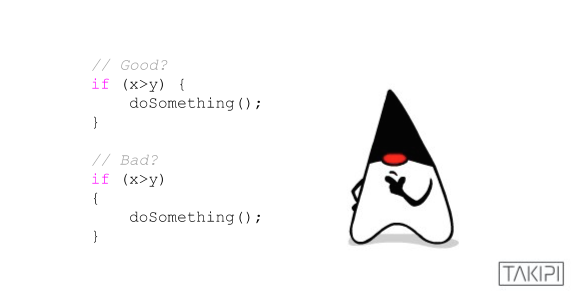 What are the most interesting highlights in popular Java code styles? In spite of the suggestive image above, we don’t want to commence any unnecessary holy wars. When it comes down to coding styles, most choices are pretty arbitrary and depend on personal preference. Yes, even if tab width changes between editors, and spaces tend to be more precise. If there were such a thing as developer team anthropology, style guidelines would probably be a major part of it. In this post we will highlight formatting guidelines and different Java coding styles in companies like Google, Twitter, Mozilla, the Java standard and our own teams at Takipi. Why use guidelines in the first place? Readability is the main consideration here. It’s almost certain that you will not be the only person to read the code that you write. And the best thing you can do for the next person who reads your code is to stick to conventions. A consistent style of writing not only helps create good looking code, but also makes it easier to understand. The twitter guidelines specify one exception and we tend to agree, “if the more ‘readable’ variant comes with perils or pitfalls, readability may be sacrificed”. Let’s see what they have in store. Java: 4 spaces, tabs must be set at 8 spaces. Both are acceptable. Data from Github suggests that around 10-33% of the Java repositories prefer tabs, and the majority use spaces in different formations, preferring 4 spaces over 2. There’s actually a pretty nice module for running this analysis (comparing different languages). BTW, peeking over to other JVM languages like Scala and Clojure, we see almost 100% 2 spaces. Considering a larger dataset that covered individual commits gave us different results (The convention analysis project, one of the Github data challenge winners), but we can estimate it to be somewhere in-between probably closer to 10%. Of course apart from natural breaks after semicolons, line breaks are used not only when lines get too long but also for logic separation. The general convention is to break after commas, before operators, and use a hint of common sense. //   - Line breaks are arbitrary. //   - Scanning the code makes it difficult to piece the message together. //   - Each component of the message is separate and self-contained. //   - Adding or removing a component of the message requires minimal reformatting. throw new IllegalStateException("Failed to process"
This helps separate statements and create a logic where each line of code represents a contained / “atomic” operation. The style guides tend to agree here. Blank lines also have an important role in the mix, separating logical blocks. The Java standard style guide also has a reference to double line breaks, separating interface and implementation. //   - Field names give little insight into what fields are used for. Moreover, another guideline we recommend to at least try to keep is making sure your exceptions are actionable, and avoid control flow exceptions. The amount of noise so called “normal” exceptions cause in a production environment is terrifying. The current state of exceptions and error handling, relying mostly on log files to get to their root cause in production, is our main motivation behind building Takipi. If you haven’t already, check it out! We’d love to hear what you think. So what do the style guides say about grouping parentheses? One guideline that we keep and didn’t find in any of the style guides is not to keep any “brains” inside constructors (so they’re safe from zombies – but not from weak jokes apparently). There are many more style guidelines that we didn’t cover in this post to avoid making this an exhaustive list, and they’re all available in the original docs linked at the beginning of the post. Readability is a major factor in keeping your code error free, and… it just feels right to keep these OCD senses from tingling. What are some of the unique guidelines / quirks that you follow? Does your company / team use a style guide of your own? Please feel free to share those in the comments section below! Reference: Tabs vs Spaces: How They Write Java at Google, Twitter, Mozilla and Pied Piper from our JCG partner Alex Zhitnitsky at the Takipi blog.